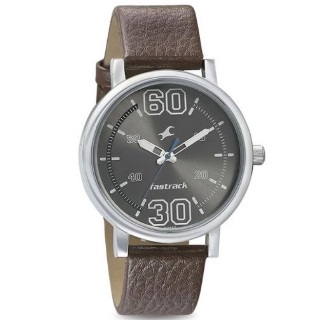 TataCliq offer - Purchase Fastrack 38052SL03 Fundamentals Analog Watch for Men worth Rs.1350 Only. If you are craving for a distinct look then this men's analog watch from Fastrack's Fundamentals collection is a must-have. Enclosed in a 43 mm case, the grey round dial secured by a mineral glass displays plain three hands, stick and numeral markings at five-minute intervals and a crown for time adjustment. The brown genuine leather strap is finished with a buckle clasp that provides a secure fit on the wrist. no coupon code needed. Shop now!